The world's constantly changing and NASA has been taking detailed images of earth’s geography from outer space for decades. Here are 20 of the most dramatic changes to our planet as recorded by NASA! Be Amazed at these 20 Dramatic Changes on Earth Revealed by NASA! Urban Sprawl Growth in Shanghai, China - This is one of the modern world’s most dramatic examples of urban expansion. Shanghai is one of China’s most prosperous economic hubs. Post-Hurricane Irma - Hurricane Irma proved devastating for the British Virgin Islands in 2017. Muir Glacier Melt, Alaska - These images of the Muir Glacier Melt show drastic differences in the amount of ice at one of Alaska’s most famous glaciers. California’s Wildflower Super Bloom - If you’re a fan of flowers, this next image will amaze you. Oil Well Fire in Iraq - While most oil wells operate without any negative incidences, there’s always the chance that something could happen if a leak or fire can’t be stopped. Shelly Island Forms - If you’re like most people, you’ve probably dreamed of owning a private island one day. Mount Pinatubo in the Philippines - The environment is remarkable at recovering after natural disasters. Peruvian Amazon Deforestation - Another interesting phenomenon captured in these images is a change in the shape of the Aguaytia River. Wadi As-Sirhan Agricultural Growth - You might think farming in the desert is impossible, but don’t tell that to Saudi Arabia. The images here were taken in 1986 and 2016 – 30 years apart. Drastic Flooding in Sri Lanka - These two images provided by NASA of the May 2017 Sri Lankan monsoon were taken four months apart, but the rain that caused the flooding happened in just 48 hours! Destruction of Okomu Forest - Human destruction of African forests has been a concern for many residents of the continent. Shrinking Aral Sea - The Construction of Artificial Islands - Oil wealth in the Gulf provides plenty of capital for governments to take on massive industrial projects. Greenland Ice Melting - While many images of climate change can be misleading, it’s hard not to ask questions when you see these next images of Greenland’s ice cover. Post Volcanic Eruption Appears in the Red Sea - The concept of underwater volcanos seems odd, but there are plenty scattered across the globe. Growing Wax Lake Outlet - Louisiana is well-known for hurricanes – Hurricane Katrina, which devastated New Orleans, proved to be one of modern history’s most damaging storms. The Wax Lake Delta has also become the focus of different areas of study. Drought in Lake Powell - Droughts in America’s West have been notoriously bad in recent decades. Lithium Mining in Chile - Now that Lithium-ion batteries are powering the world – from laptops to iPhones - countries like Chile that have an abundance of Lithium are cashing in on their reserves. Urban Expansion in New Delhi, India - Between 1991 and 2016 – when these images were taken – New Delhi’s population increased by 16 million people. 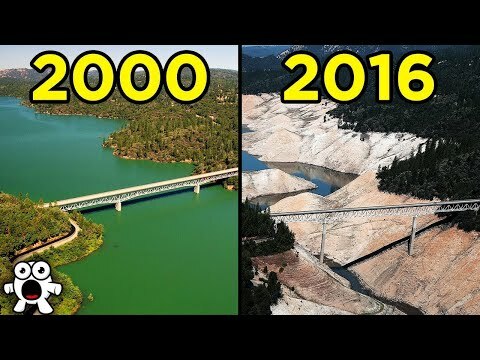 Lake Oroville Drought, California - Lake Oroville is one of Americas most famous man-made lakes. Wow!!! AMAZING IDEA for a drill. Homemade inventions.